Frank Perry’s trainee evangelist quickly told the man that God can forgive anything. He seemed eager to ‘get right’ with God – and proceeded to repent of his past and ask Jesus into his life on the spot. “He seemed to feel so good to be forgiven and ‘born again’,” reported Frank, who had been watching the scene unfold. 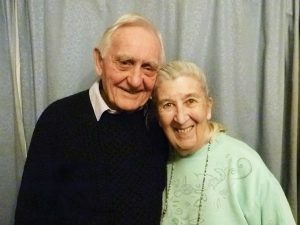 This recent salvation in East London is just one of Frank and Olive Perry’s amazing testimonies. The indomitable evangelists have seen “hundreds” of salvations, healings and miracles over more than 30 years of outreach around the globe. Frank, 82, is a convention speaker and has opened many new chapters of the Full Gospel Business Men’s Fellowship International in the UK and abroad. But when Frank was asked how many times he had been physically attacked, the answer was ‘never’ – in 50 years. “He is divinely protected,” says Olive. At a church in Dagenham, previously reluctant church members hit the streets and saw about 35 people give their lives to Jesus. The Kent pensioners say the Holy Spirit always “sets up” their work. During an outreach in Manchester in 2017, over 110 people prayed to accept Jesus into their lives. Three weeks later, a suicide bomb exploded in Manchester Arena, killing 22 people and injuring 116. “We are not teaching how to win the lost by persuasive argument,” said Olive. “We pray for anyone who will accept a prayer from us, thereby letting the Holy Spirit do the work.” Towards the end of the encounter Frank and Olive might ask, “Did you feel anything as we prayed for you?” And a “good proportion” do say they’ve experienced the presence of the Holy Spirit. 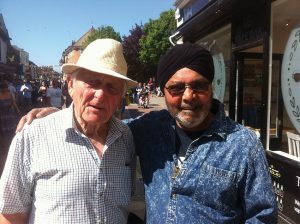 Most weeks the couple see between four and ten responses, with 80 responses in one day at Sweeps Festival in Rochester. They have done outreaches in Sittingbourne, Orpington, Eastleigh, Oxford, Whit-stable, Woolwich, Billericay and the Medway Towns. A recent advert in HEART has prompted fresh requests from churches for their dynamic evangelism training. They translate this as, “whenever anyone is prepared to make the effort and do the outreach”.